Vector Pong : A Ping -pong game for 1 or 2 players. Frogs n Flies : Eat-em-up game for 1 or 2 players. Hex : Shoot the enemies and avoid barriers for bonus points in this twitchy action game. 1 player only. Supports Atari Driving controller in port 2. Space Race : Avoid the asteroids and complete ‘laps’ of the asteroid field to win. 1 or 2 players. Quick Shot : Test your button mashing skills. 1 player only. Doodle : Use the Vectrex light-pen or joystick to doodle drawings on screen. 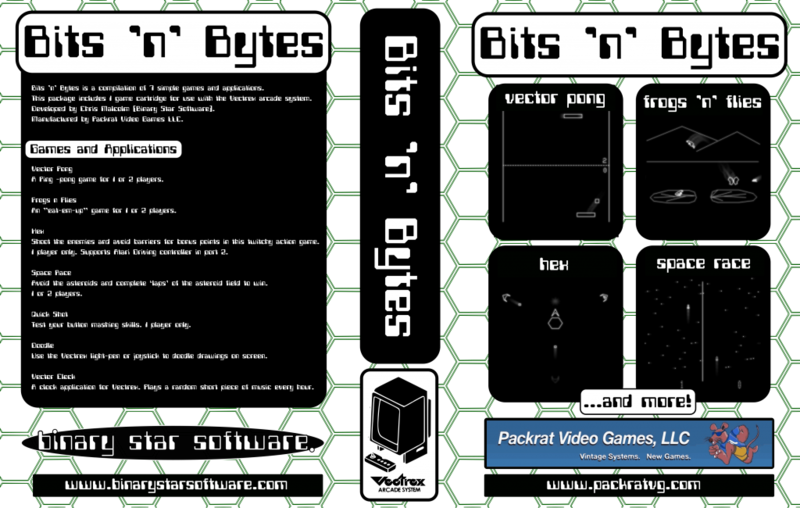 Vector Clock : A clock application for Vectrex. Plays a random short piece of music every hour.